Both touching and humorous, Passing By…describes the journeys of a modern day troubadour. 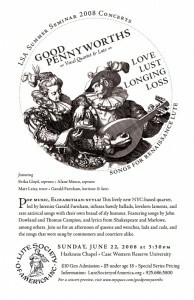 This entertainment for the parlor features Renaissance lute songs, songs from Shakespeare’s plays, traditional folk ballads and classics from the 1960s, plus words from Shakespeare and contemporary poets. Garald Farnham has entertained children and adults on five continents with his Renaissance spirit and song. Drawing from these experiences, he has created this spontaneous evening of stories and songs. 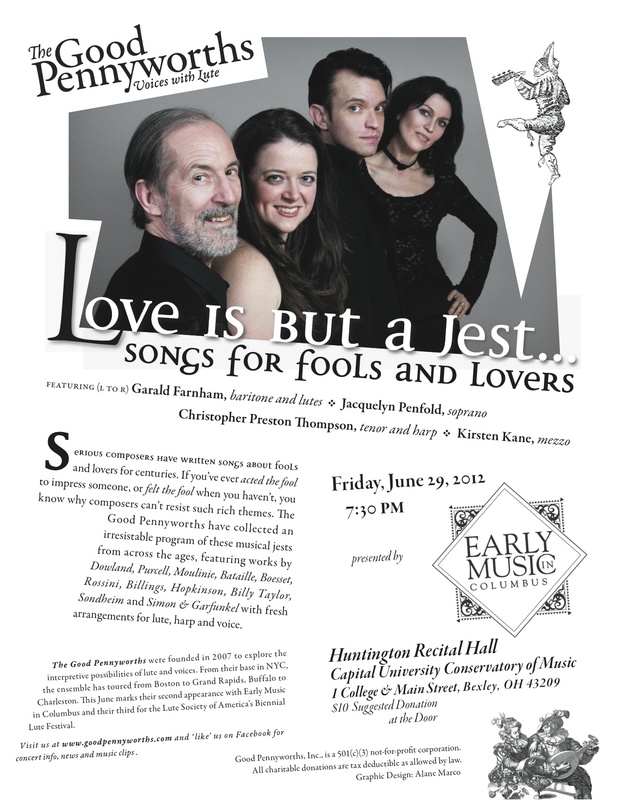 Love is but a Jest: Songs for Lovers and Fools – Although the lute was primarily an instrument that thrived during the Medieval, Renaissance and Baroque periods, with imagination our quartet has realized accompaniments for music from later periods. 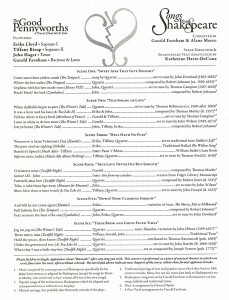 Using a theme based on minstrelsy and foolery, we have drawn together a concert that not only embraces Renaissance lute songs by John Dowland and his contemporaries, but also Medieval songs, Classical songs by Mendelssohn and Rossini, several songs by early American composers and some contemporary songs by Billy Taylor, Stephen Sondheim and Simon and Garfunkel. Audiences go away with the pleasure of hearing music they have heard in other venues accompanied by the sweet sonorities of the lute. 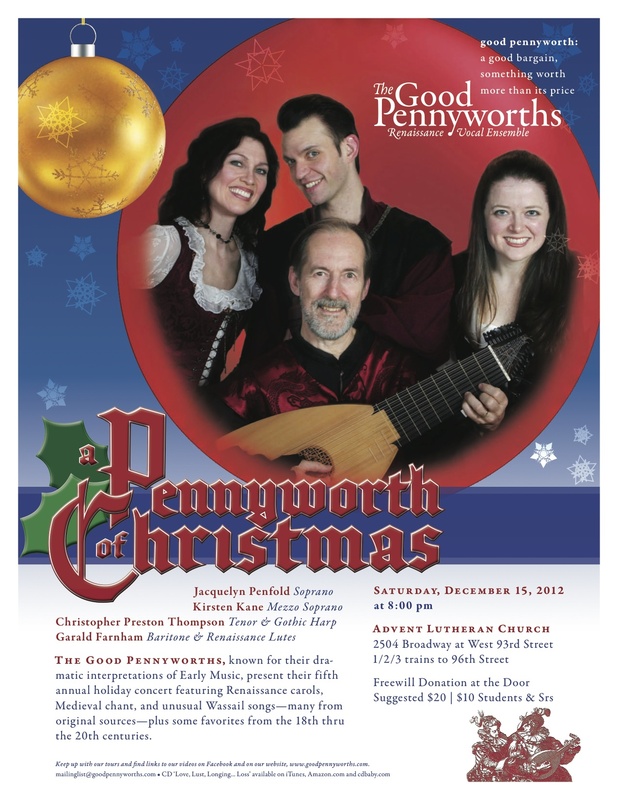 A Pennyworth of Christmas – A Yuletide classic that gets better each year. 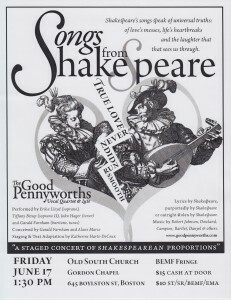 In this concert we broaden our usual Renaissance and Elizabethan repertoire to explore a quilt of carols and winter holiday songs. 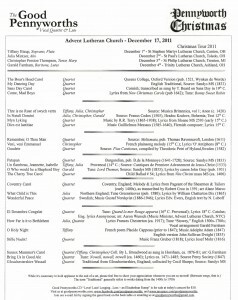 We make sure to include some ancient and lessor known carols with interesting histories, some cherished favorites from the 18th & 19th centuries, some Appalachian and folk tunes, plus English translations of carols from other countries, and modern favorites that can be given a Renaissance twist. We also look for songs that we feel would especially (and unexpectedly) benefit from a lute accompaniment. Sometimes we incorporate surprise moments of poetry, from Christmas trees on subway trains to Dylan Thomas’ whirling wordscapes of Welsh boyhood. These songs and lyrics give us hope. They inspire us in our darkest moments. They make us think about what’s important in life. Audience members frequently comment that they were surprised by how personally meaningful the concert was for them. That’s the highest compliment we could wish for. Love! Lust! 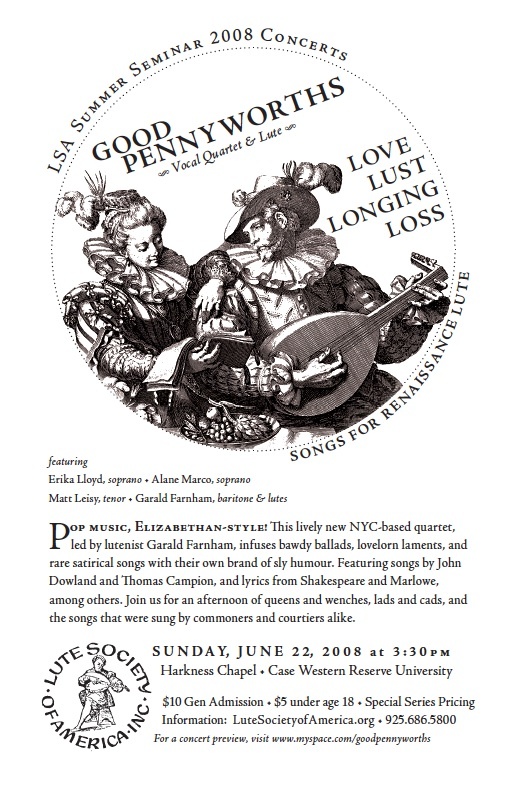 Longing… Loss – an Elizabethan Romp – In the late 1500s and early 1600s, the lute songs, ballads, theatre songs and pub songs in this program were the “pop music” of their day, a musical language known to all classes of society, from courtiers to commoners. 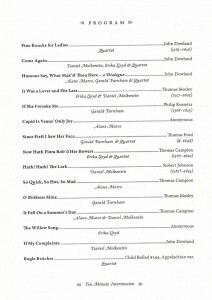 As singer/actors, we use every tool at our disposal to give historically-informed performances that are not bloodless copies, but are rich and alive with meaning, humor and drama, as well as musical artistry. 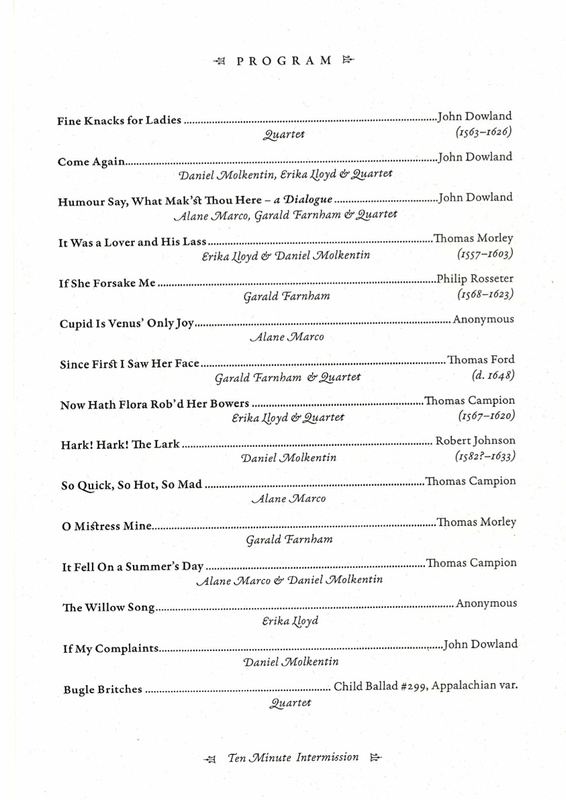 We perform the songs in such a way that modern listeners can more readily understand the nuances of the poetry and the stories told therein. 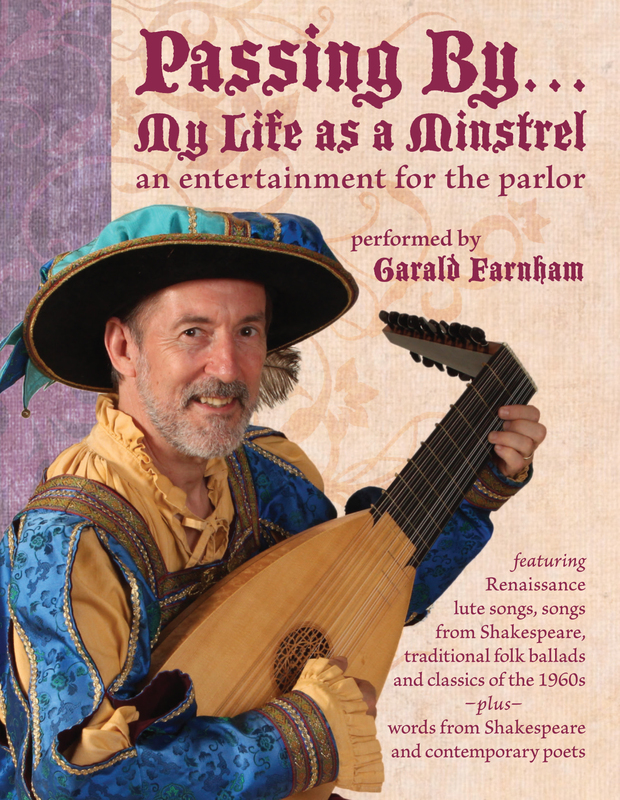 Your audiences will come away with a sense of the richness and range of popular music during the renaissance – from bawdy tales of soldiers and wenches to heartfelt love songs to tongue-in-cheek lovelorn laments and political satires. 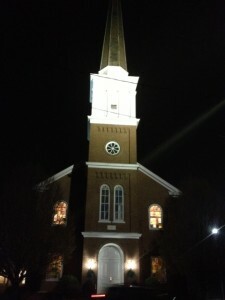 A special thanks to Glenn Hahn and the fine folks at Jordan Lutheran Church in Orefield, PA who came out to make our concert a joy and a success! What an extraordinary reception they served after the concert. From the oysters to the cider a l’orange, we were spoiled, and enjoyed the fine company. 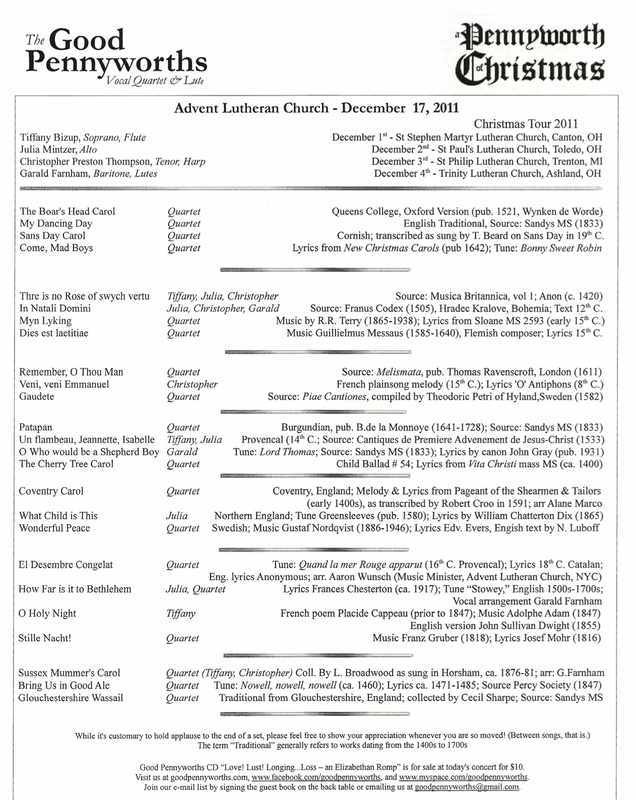 This was the debut of our new Christmas program, and performing it in the acoustical gem that is Jordan Lutheran’s sanctuary was truly moving. Lutenist Garald Farnham was interviewed by music critic Robert Plylar for The Observer newspapers in advance of our Chautauqua concert and master class to be given this month. 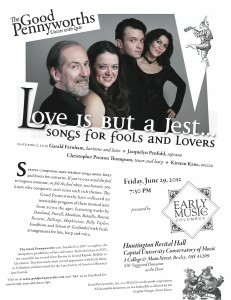 We’re pleased to announce our newest concert program, Love Is But A Jest… Songs for Fools & Lovers, premiering June 9, 2012 (8PM) at our home venue, Advent Lutheran Church, W93rd & Broadway in Manhattan. 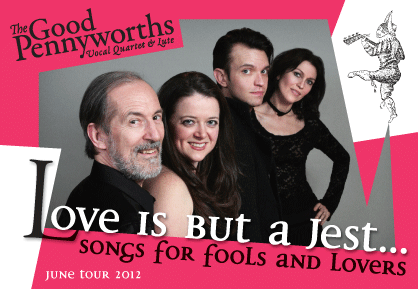 Performing are (L to R) Garald Farnham (baritone, lutes), Jacquelyn A. Penfold (soprano), Kirsten Kane (mezzo) and Christopher Preston Thompson (tenor, gothic harp). 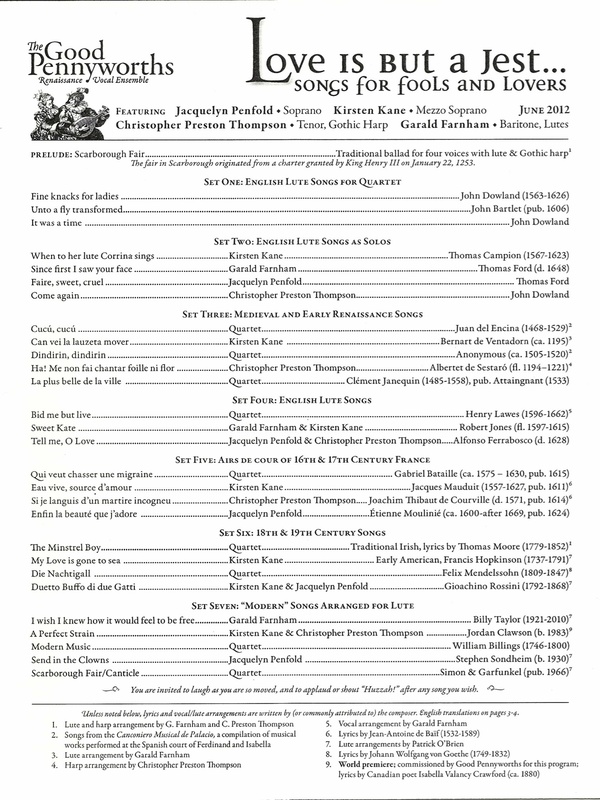 This Spring, we’ve been assembling songs that deal with the silly and sublime natures of love, a subject mused on by serious composers from many musical eras. If you’ve ever acted the fool to impress someone, or felt the fool when you haven’t, you know why composers can’t resist such rich themes. 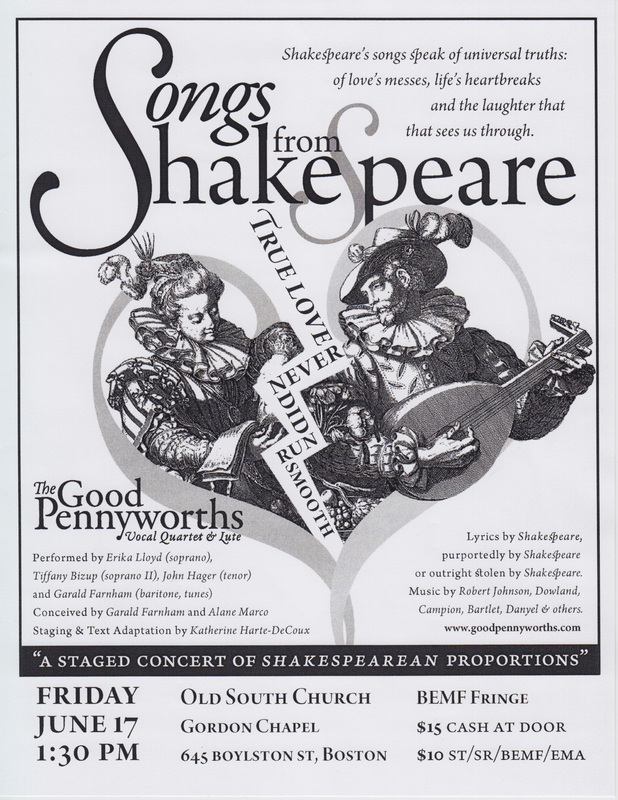 This collection of musical jests features music by Dowland, Purcell, Mozart, Moulinié, Bataille, Boesset, Rossini, Billings, Hopkinson, Billy Taylor, Stephen Sondheim and Simon & Garfunkel, with fresh arrangements for various combinations of lute, gothic harp and voice. We’re also thrilled to be premiering our first commissioned work, “A Perfect Strain,” with music by NYC-based jazz composer and pianist Jordan Clawson, set to lyrics by 19th century poet Isabella Valancy Crawford. 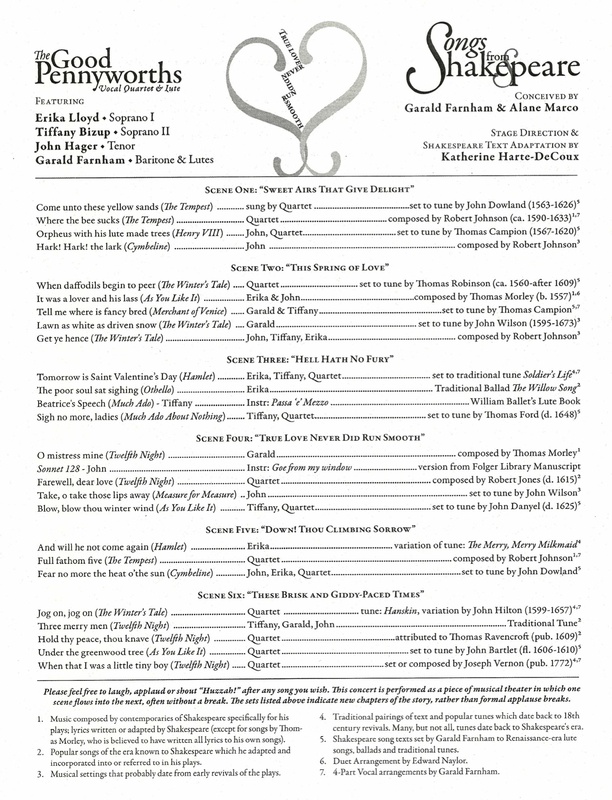 Jordan has written a truly breath-taking new piece for two voices and lute. Our Western NY and Midwestern fans can join us for one of our upcoming June tour dates, featuring return performances at Early Music in Columbus, the Lute Society of America, the Chautauqua Institution and St. Paul’s Lutheran Church in Toledo. 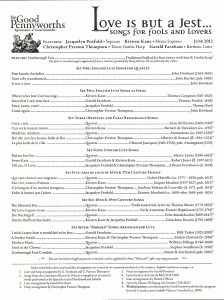 We’ll also be presenting a Master Class before our evening concert at the Chautauqua Institution on Sunday, June 17. Here’s the itinerary! You may check the Dates page for full concert details and venues. We hope to see you on the road or here at home in NYC! Send us an email and tell us what you think!